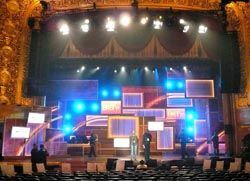 NEW YORK, NY-- Scharff Weisberg provided an extensive lighting rig comprised of VARI*LITE and LED fixtures for the first annual BET Honors produced by cables BET Network. Designed to honor important members of the African-American community, the show was taped at Washington, D.C.s Warner Theatre January 12 and will premier on BET February 22. The BET Honors celebrate black achievement in business, entertainment, social justice and philanthropy, and showcase the kind of dynamic musical performances that make BET specials stand out. Honorees include Janice Bryant Howroyd, winner of the Entrepreneur Award; Richard Parsons, winner of the Corporate Citizen Award; Dr. Cornel West, winner of the Award for Education; Tyra Banks, winner of the Media Award; Congresswoman Maxine Waters (D-Calif), winner of the Public Service Award; and Alicia Keys, winner of the Entertainment Award. Scharff Weisbergs systems worked beautifully, reports lighting designer Alan Adelman. We used the lighting package to create a somewhat subdued look for the show. The set had very warm wood tones with the back wall, floor and side panels featuring a parquet look. It wasnt designed to take myriad colors; it was best lit with a warm character." By using a combination of VARI*LITES and LEDs, Adelman was able to make the elements really work well together, And Scharff Weisberg was great throughout. I'm always grateful for the pristine equipment and support they provide me, he continues. Adelman has numerous credits as a lighting designer, including The DEF Comedy Jam for HBO, The Mark Twain Prize with winners Billy Crystal and Steve Martin, Great Performances: Dance in America for PBS and live concert specials with Jay Z and Eminem for SHOWTIME. Earlier this year he called on Scharff Weisberg when a second season of HBOs P. Diddy Presents The Bad Boys of Comedy got underway at the Brooklyn Academy of Musics Harvey Theater. "It has been great to support Alan in finding new and diverse equipment to create new looks for his television projects," concludes Scharff Weisberg Vice President Chris McMeen.